a boy! 9 lb, 4 oz, 22 in. 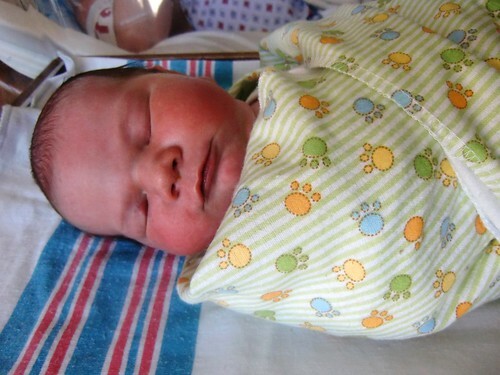 long – born june 29th at 1:08 in the afternoon. This entry was posted in baby, the fam by cosymakes. Bookmark the permalink. Congratulations!!! :) Btw my niece was born yesterday too! Congrats! Beautiful baby! Boy or Girl? Oh my gosh!!! He’s so adorable and pudgy!! Wow! I can’t believe it! WOW! Big too!!! WOWOWOWOWOW! So happy for you both! ALL THREE OF YOU! WAAAH! He is beautiful! and so big! Ouch! Congratulations to you and Ben, Cosy! Congratulations! He is beautiful!! And littleman was the same weight and measurements! BIG baby! You grow them good, momma! Rest up and enjoy getting to know one another!! Congratulations! My birthday is June 29, a really great day for a birthday! Aww what a sweetie! Congratulations!!!! Welcome to the MoB!! (Mothers of Boys) Congrats! Yay! Sooo happy for you! Can’t wait to hear your birth story (if you’re keen to share, of course). For now, I hope you 3 are surrounded with lots of love and support as you make this amazing and intense transition. Congrats on the addition to your family! Congratulations!! Many blessings on you and your little one! Congratulations Cosy and Ben! Glad everyone is safe and sound through this passage into family-hood :) I’m finishing up my socks out of your lovely handspun this weekend as a celebration of turning in my tax accounting midterm. 9 lbs +! A very healthy baby! He is beeeeeautiful, love the swaddled sleeping baby! Congratulations Cosy and take care of yourselves…. i have a huge smile on my face right now! he’s beautiful and i am so happy for you!!!! Congrats! and welcome to the big baby club :) His cheeks are adorable! OMG cosy he is beautiful! congratulations! Congratulations mama!! Many blessings for his & your futures! Congrats to you and yours. Your baby boy is adorable. Can’t wait to see pics of him in all of the lovely knits you have made. What is his name? God bless you and your new son and all of your family. And what a beautiful boy! Congratulations! I am so happy for you and your husband. Family is wonderful. What a darling! Congratulations, always happy to see your journal! Greetings from Russia! totally missed this post! Hope you are resting well and deeply. CONGRATULATIONS! I am SO behind! He is ADORABLE!! Hope all is well with you and your family – nom those cheeks once for me!